New TV series Continuum explores a dystopia of corporate hegemony, time travel and human augmentation and establishes a compact transmedia world with strong gaming elements. Even though the Canadian network Showcase does not break any new ground, it ties various transmedia episodes in interesting ways and in many occasions creates unclear situations on the borders of the fictional and the meta-fictional discourse. I will try to describe how this small-scale transmedia storytelling works, what are its specifics and how collective intelligence maintains ARG role-playing among various platforms. The main heroine Kiera in a body suit from a year 2077. 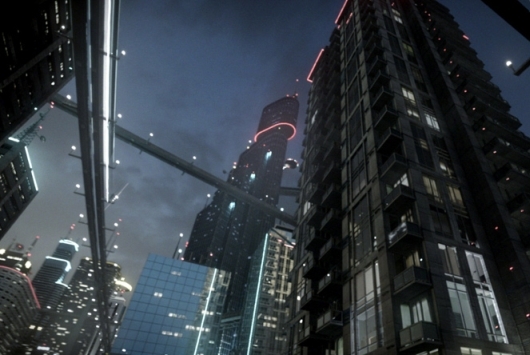 The fictional world of Continuum mostly resembles videogame series Deus Ex (with the time travel elements of the Terminator franchise). The cyberpunk feel is induced by the corporate control over the government in 2077. Future citizens of North American Union (Canada + USA) are forced into conformity by a police force of augmented humans, so-called protectors. Corporate government is not without resistance, a group of freedom fighters (Liber8) rebels against the status quo of 2077. Unable to achieve their agenda in 2077, they travel back in time to 2012 to change the course of history. Along with them comes their enemy, the protector Kiera Cameron. The underlying theme of the show is a struggle between the individual and the collective values. The individual scope is represented by the main herione Kiera who devotes her life to protection of others, including the oppresive corporate regime. The collective is represented by the group Liber8 who uses any means neccessary to liberate the future from the corporate control. The TV series and other transmedia episodes portray this struggle in a neutral fashion, therefore enabling a better engagement in Continuum ARG which requires (or recommends) a player to side with one of the movements. The Continuum fictional world converges across following platforms: homepages, official forums, facebook and twitter pages, syndicated blog posts, alternate reality game hub, fictional blogs and websites, TV series. Transmedia storytelling itself takes place mostly in the TV series, ARG, its fictional forums and blogs and to a lesser extent in some of the syndicated blog posts. In accord with theoretical findings of Henry Jenkins (2007), creators of Continuum transmedia storytelling are mostly concerned with world building. Both the ARG and blog posts explore two main timelines of Continuum universe: years 2012 and 2077. Main heroes from the TV show are usually absent here, the movements, ideals and technology remain. This absence also ensures that the canon stays intact. It is important to remember that Continuum only replicates what has been already tried in TV shows. Both ARGs (Dena 2008) and syndicated blog posts (Hardy 2011) have been deployed before, but usually for much more bigger shows like ABC's Lost (ARG The Lost Experience) or HBO's True Blood (fake blog Bloodcopy). Visions of Future is a series of blog posts from active Canadian bloggers about various concepts (family, community, leadership, beauty, food...) in the future timeline of Continuum. Bloggers take different approaches to these articles - some write short stories set in the fictional world of Continuum, others try to predict the situation of 2077 in a genre of essays. Vast majority of these blogs are focused on a female demographic which can come as a surprise if we consider that Continuum is a sci-fi/crime investigation/conspiracy TV show. On the other hand, Showcase may broaden its audience by using opinion leaders from different areas of interest. While syndicating content to blogs is not a new thing, Showcase achieved more than just marketing of its new TV show. Seven of 10 articles from Visions of Future are written as fictional stories set in the world of Continuum, therefore broadening and enriching the whole transmedia storytelling. The fact that the blog posts are syndicated and not fan-created, helps to establish their canonicity. Continuum the Game is a typical alternate reality game (ARG) based around fictional websites, puzzle solving, collective intelligence and also some live missions (Dena 2008). The narrative of the game follows fictional amateur journalist Tyler Cross in her fight against the Canadian cells of Liber8. The main goal is to decode all blueprints to the time device which was used in the show. Players can side either with Tyler Cross or Liber8 movement and receive special missions according to this choice. Fictional web presence of these two antagonists (blogs, tweets, videos) is also the main source of puzzles and hints. At the same time, these game components enrich and further develop the transmedia storytelling of Continuum. Producers of Continuum ARG, so-called puppetmasters (PM) in ARG terminology, count with both the hard-core players and the casual players. The most successful ones (i.e. those who find the hidden codes or are the first to decode a blueprint) are awarded bonus points in leaderboards and gain special social status. Casual players receive help in a form of PM-created weekly recaps (Dena 2008) of what has happened in the fictional world. While Dena is mainly concerned with the identification of the magic circle, I am more interested in how players manage the transtition between the fictional and the meta-fictional discourse in relation to role-playing, in other words how they avoid and eliminate cues to the gameplay nature of the ARG. We can assume that this enforcment of the right discourse for the right platform is also player-driven (not PM-driven). The official forums of the Continuum ARG are mostly set in the meta-fictional discourse and provide so-called anachrony audits (Dena 2008) in forms of timelines (1st part, 2nd part) and other instructions about the game itself or the TV series. There are also role-playing fictional posts right next to them, this co-existence does not seem to bother any of the forum visitors. Discoursal unity is taken quite differently on the two main fictional sites, especially on Liber8 forum. On Tyler Cross's blog there are only two situations of a collision between the discourses. Under the post STOP LIBER8 user Manuel writes: "This is a Game or... what? I write from Honduras..." (Manuel 2012) Active (role-)players ignored him. The second case is on the verge of both discourses but can be maybe interpreted as a sudden appearance of the meta-fictional discourse. Anonymous user writes: "whats the code yankee white" (Anonymous 2012). Yankee White replies: "I'll help you when you stop posting Anonymously. :)" (Yankee White 2012) The anonymous user is mainly concerned with the success in meta-gaming, i.e. when a player submits a code, they get points in leaderboards. Yankee White's reply can be seen either as a motivational post towards better role-playing, or as role-playing - Yankee does not want to reveal any infromation to the rival group Liber8. Nobody else joined this discussion. But starting with post from jko the whole discussion is being redirected to a role-playing fictional tone. User jko answers a meta-fictional question "Organize what?" (hazmat14 2012): "Organize ourselves to combat the exploitation of capitalism. The message of liber8 is not all that different from the message we need, Kagame (note: leader of Liber8) discusses the angers people feel being just a cog in a machine working in an exploitative and alienating setting [...]" (jko 2012) Others, even hazmat14, then join him and together they abandon the meta-fictional discourse. In a different thread user RoWvote@gmail.com agitated for an unrelated (and real life) petition against bankers. Active role-player GregorFrolov replied in a fictional tone but did not avoid to mention that the petition can be taken as a sidequest for Liber8 forces: "Educate yourselves on this matter - liberate your minds - and decide on your own if this is a worthy sidequest to promote the Liber8 agenda in this timeline." (GregorFrolov 2012) It is important to note that quests and sidequests are role-playing game adequates of tasks and in this case may reveal the game-like nature of Continuum ARG. The original poster RoWvote@gmail.com then closed the discussion: "Nothing like a side quest to change your perspective of the game." (RoWvote@gmail.com 2012) This statement effectively ruined the preceding attempts to stay in fictional discourse, because it acknowledged the nature of the Continuum ARG. Players of the Continuum ARG do not only have to cope with use of the meta-fictional discourse, but also with spam which reportedly flooded Liber8 forums. From our previous findings we can predict that the interaction with spam will differ depending on the main discourse of the platform. For example, user Sebastian on the Liber8 forums writes: "I reported it to RiseUp (note: forum admin) as spam, it just may take a few hours to disappear." (Sebastian 2012b) He reports spam but stays within the fictional discourse. Quite surprisingly, spam can be also an incentive for role-playing. In the same thread, Grimm reacts to Sebastian's message: "free speech, why u reporting and deleting stuff? i thought we stood for somthing" (grimm 2012) User ToZiKa plays along: "We do not "stand" for bad rappers (note: the spam post included a YouTube video) though. We should concentrate on the important things! On the mission!" (ToZiKa 2012). Of course most players are just annoyed by the spam and want to see it erased: "there r still some crap posts annoying the xxxx out of me." (Pizano 2012). Continuum is a small transmedia world which mostly uses already proven concepts. In the first part of this article, I reviewed the structure of transmedia storytelling and found rather sophisticated use of syndicated blog posts that expand the Continuum world. Not all of these blog posts are exactly successful in world building, but 7 of total 10 are set within the fictional discourse. The second part focused on Continuum ARG. Alternate reality games are by themselves already examples of transmedia storytelling (Dena 2008) converging across many platforms. At the same time, they are a form of participatory culture (Jenkins 2006): players in cooperation with producers (in this case puppet-masters) are actively creating content and building the canon. After basic overview, I delved into the question of role-playing within transmedia world, especially the management of the fictional discourse. While players usually ignored meta-fictional posts in Cross' Worlds fictional blog, participants on Liber8 forum were quite often trying to reverse the meta-fictional discourse and to maintain the role-playing nature of the Continuum ARG. 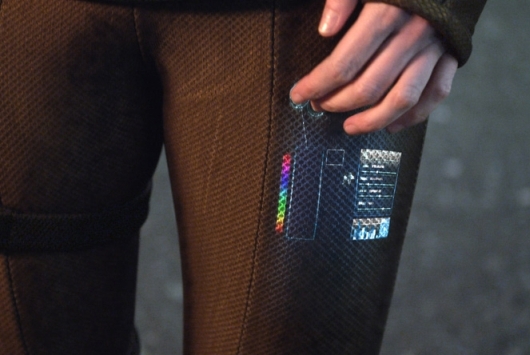 This article had a humble aim to map a case of a transmedia world. There are no great discoveries, just small observations. Continuum is a compact world with roughly 1 350 registered players of the ARG and 15 000 likes on official Facebook page. The number of active participants of the transmedia storytelling is even smaller and in my estimation does not exceed one hundred. Despite the relatively small reach, creators are using modern tecniques to enable participation and exploration of the world of Continuum. Dena, Christy (2008). Emerging Participatory Culture Practices: Player-Created Tiers in Alternate Reality Games. Convergence 2008 14: 41. Hardy, Jonathan (2011). Mapping Commercial Intertextuality: HBO's True Blood. Convergence 2011 17: 7. Jenkins, Henry (2006) Convergence Culture: Where Old and New Media Collide. New York: New York University Press. Jenkins, Henry (2007). Transmedia Storytelling 101. [Retrieved online] http://henryjenkins.org/2007/03/transmedia_storytelling_101.html. Anonymous (2012). Josh's last message to me... Cross's Words. 26 July 2012 15:07, retrieved online 2010-08-10 http://crosswords333.blogspot.cz/2012/07/joshs-last-message-to-me.html?showComment=1343340431793#c7039020572547947221. DeFranko (2012). I don't get it. Liber8Ops Forum. 07-18-2012, 12:06 AM, retrieved online 2010-08-12 http://liber8.com/forums/showthread.php?tid=91&pid=445#pid445. Frenchoriel (2012). I don't get it. Liber8Ops Forum. 07-16-2012, 11:36 PM, retrieved online 2010-08-12 http://liber8.com/forums/showthread.php?tid=91&pid=414#pid414. GregorFrolov (2012). Jail for the Banksters. Liber8Ops Forum. 07-12-2012, 03:22 PM, retrieved online 2010-08-12 http://liber8.com/forums/showthread.php?tid=64&pid=346#pid346. grimm (2012). Live places. Liber8Ops Forum. 06-16-2012, 08:35 PM, retrieved online 2010-08-13 http://liber8.com/forums/showthread.php?tid=7&pid=170#pid170. hazmat14 (2012). I don't get it. Liber8Ops Forum. 07-17-2012, 10:19 PM, retrieved online 2010-08-12 http://liber8.com/forums/showthread.php?tid=91&pid=444#pid444. Jezebel (2012). Surveillance Ops. Liber8Ops Forum. 07-11-2012, 08:58 PM, retrieved online http://liber8.com/forums/showthread.php?tid=15&pid=336#pid336. jko (2012). I don't get it. Liber8Ops Forum. 07-18-2012, 08:28 AM, retrieved online 2012-08-12 http://liber8.com/forums/showthread.php?tid=91&pid=448#pid448. Langleyier (2012) Liber8 site swamped with spam. Continuum the Game forum, 2 weeks ago, retrieved online 2010-08-13 http://continuum-the-game.com/community/discussion/view/id/82253. Manuel (2012). STOP LIBER8. Cross' Words. 5 August 2012 22:19, retrieved online 2010-08-10 http://crosswords333.blogspot.cz/2012/07/stop-liber8.html?showComment=1344230381434#c6323572418683035801. Pizano (2012). Liber8 site swamped with spam. Continuum the Game forum, 3 weeks ago, retrieved online 2010-08-13 http://continuum-the-game.com/community/discussion/view/id/82253. RoWvote@gmail.com (2012). Jail for the Banksters. Liber8Ops Forum. 07-13-2012, 04:27 AM, retrieved online 2010-08-12 http://liber8.com/forums/showthread.php?tid=64&pid=367#pid367. Sebastian (2012a). I don't get it. Liber8Ops Forum. 07-17-2012, 12:33 AM, retrieved online 2010-08-12 http://liber8.com/forums/showthread.php?tid=91&pid=416#pid416. Sebastian (2012b). Live places. Liber8Ops Forum. 06-16-2012, 04:05 AM, retrieved online 2010-08-13 http://liber8.com/forums/showthread.php?tid=7&pid=169#pid169. Sebastian (2012c). Liber8 site swamped with spam. Continuum the Game forum, 3 weeks ago, retrieved online 2010-08-13 http://continuum-the-game.com/community/discussion/view/id/82253. ToZiKA (2012). Live places. Liber8Ops Forum. 06-16-2012, 09:30 PM, retrieved online 2010-08-13 http://liber8.com/forums/showthread.php?tid=7&pid=171#pid171. Yankee White (2012). Josh's last message to me... Cross's Words. 26 July 2012 15:10, retrieved online 2010-08-10 http://crosswords333.blogspot.cz/2012/07/joshs-last-message-to-me.html?showComment=1343340600293#c5123636145748472573. All pictures are stills from the TV series and belong to Showcase. Hey. I'm the producer of the Continuum transmedia project. Loved your analysis. Thanks for taking the time to go through things with such thoughtfulness. Thanks for your feedback. I am glad you liked my analysis. I had a lot of fun exploring the transmedia storytelling of Continuum.